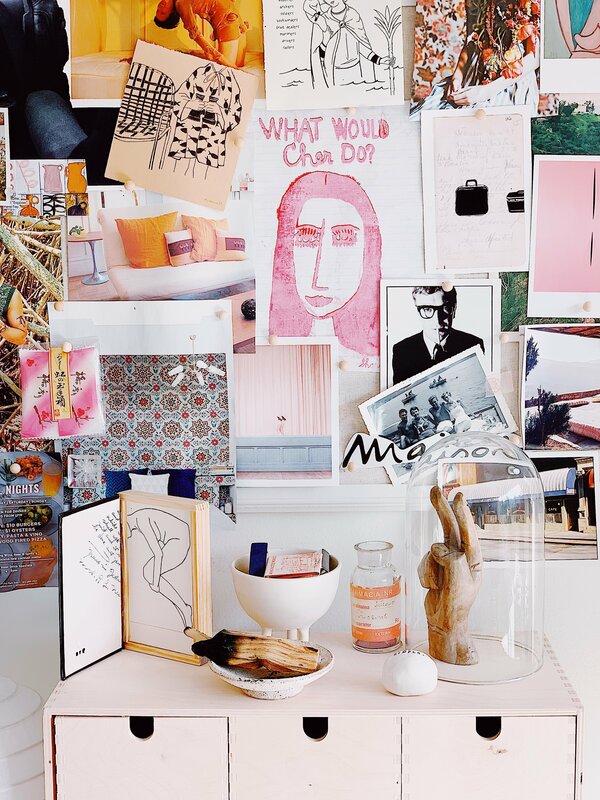 See how SF Girl by Bay's Victoria Smith lives and breathes the inspired life. Our latest collaborator is California lifestyle blogger and influencer Victoria Smith. 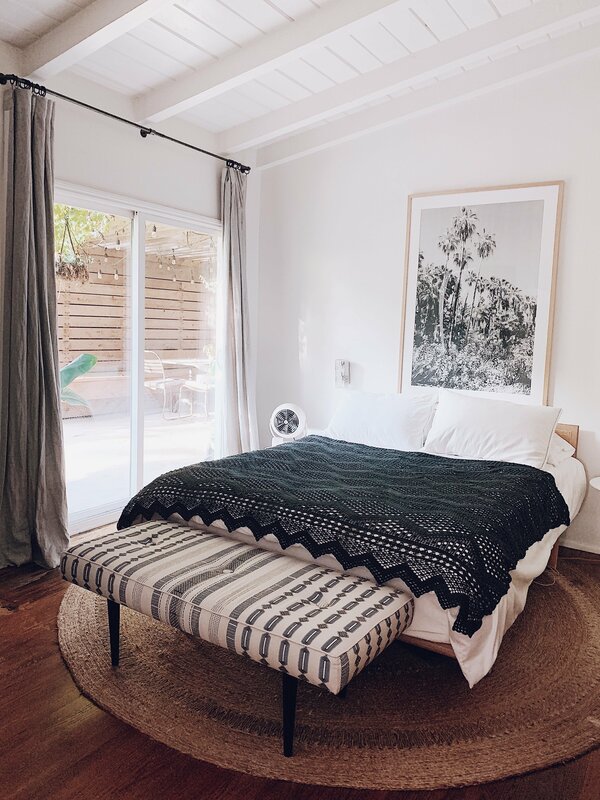 She came to the scene as SF Girl by Bay, but these days you can find her in Los Angeles in one of the most picture-perfect bungalows we've ever seen. There's nothing quite like arriving to someone's house and thinking: "Wow! This is a home." 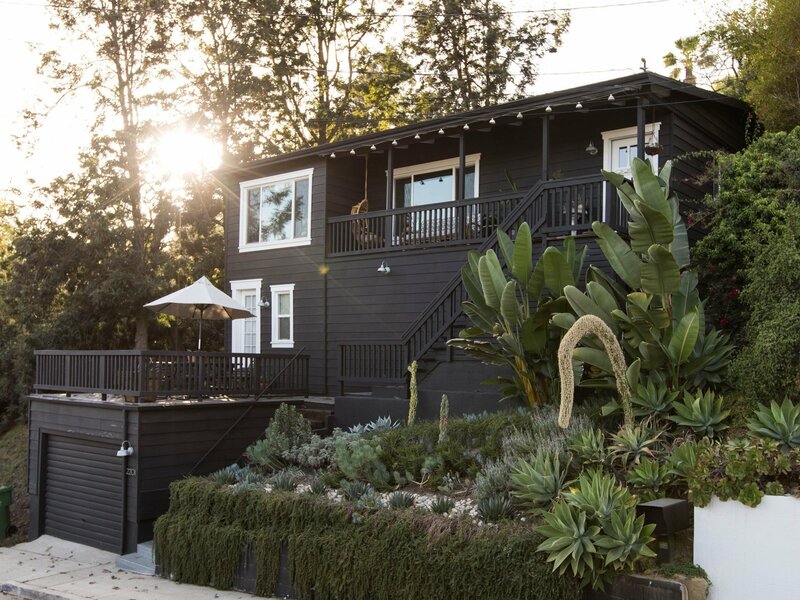 For the exterior of her Echo Park home, Victoria selected Benjamin Moore's Onyx Black, which feels both chic and subdued against her lush greenery. 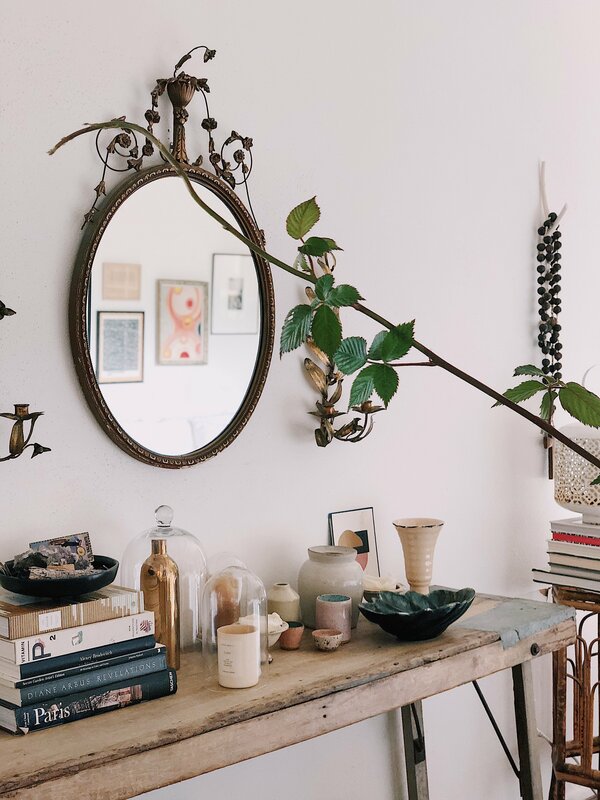 Just off the front door, Victoria has beautifully styled a vintage console with a collection of vintage pieces—the ceramics, the mirror, and the wall sconces. It's the perfect spot to set your keys and double check your lipstick on the way out. 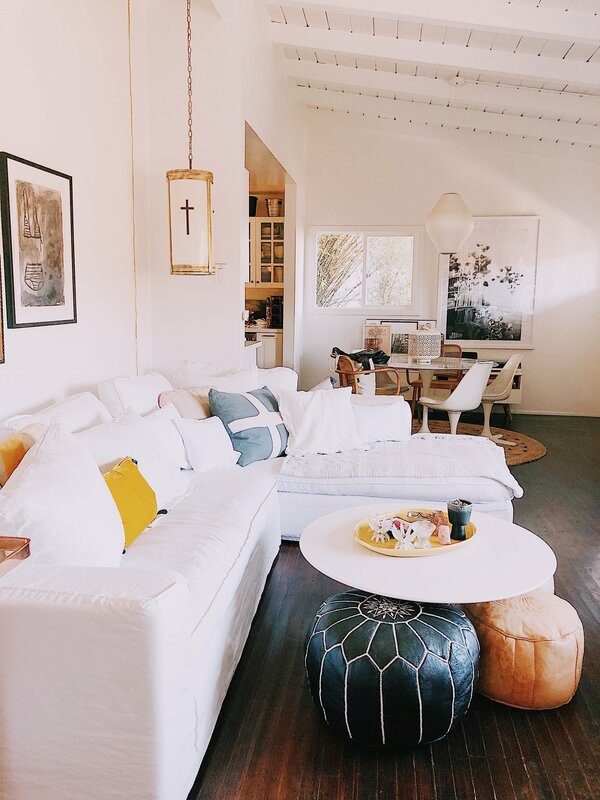 In her open living room, Victoria opted for a slipcovered sectional and a collection of poufs, all anchored around an iconic Saarinen coffee table. This space is designed for lounging. 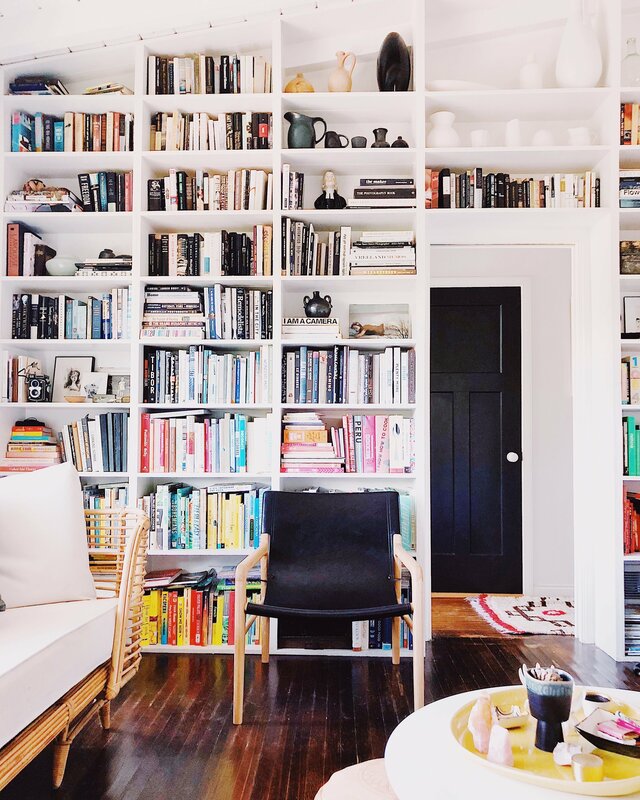 It's no surprise that this tastemaker has a massive library (obviously organized by color). Victoria designed these built-in book cases to fit the angled ceiling, creating an "oh so charming" effect. The black leather chair is from Barnaby Lane. 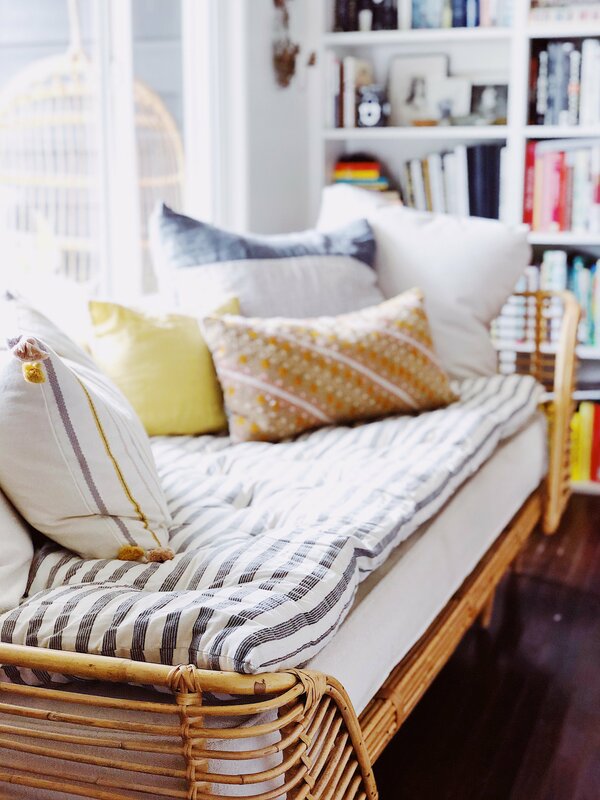 Victoria's vintage daybed from her shop Super Marché provides the perfect perch. We can only imagine nestling up with a book or taking a mid-day siesta here. 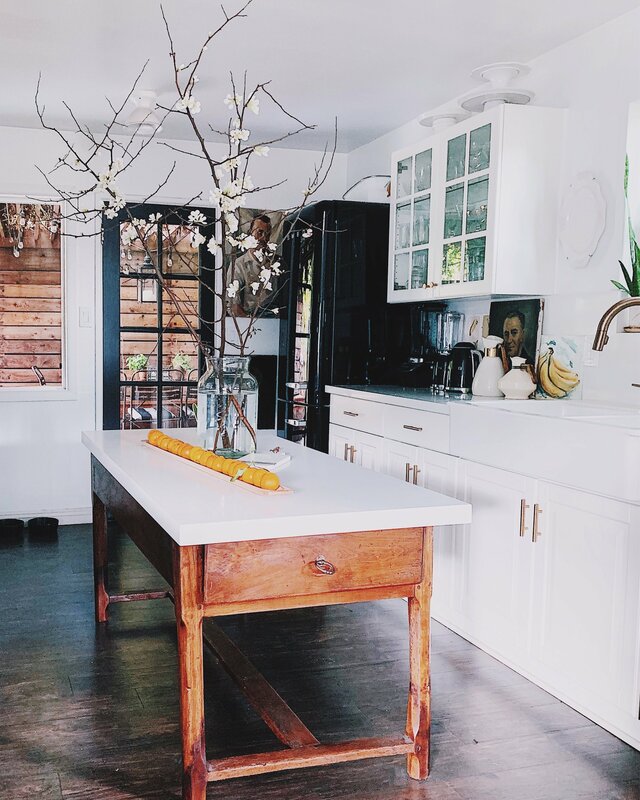 For her kitchen remodel, Victoria centered the design around her mother's old French farm table, for which she had a piece of Caesarstone custom cut. In her home office, Victoria is constantly pinning up photos, tears, and ephemera whenever the mood strikes her. 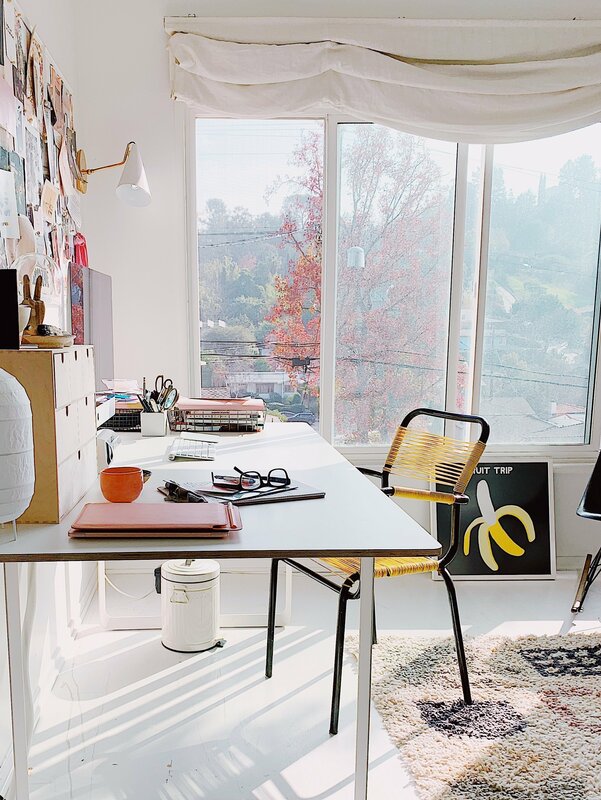 Victoria's home office features a vintage chair from France and a Nathaniel Russell Fruit Trip Print. Both offer a sunny pop! It's hard to pick the best thing about Victoria's bedroom. There's the view of the backyard patio, the hand-dyed vintage crochet, and the Mid-Century Bench in Tusk Doro. This bedroom really captures her spirit: relaxed and bohemian yet thoroughly modern. 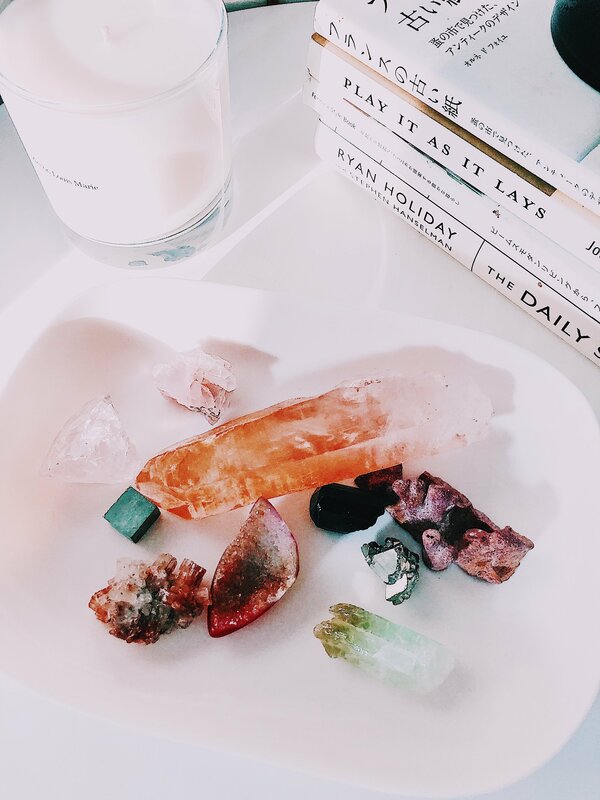 Victoria's bedside table is adorned with her crystal collection and favorite reads. 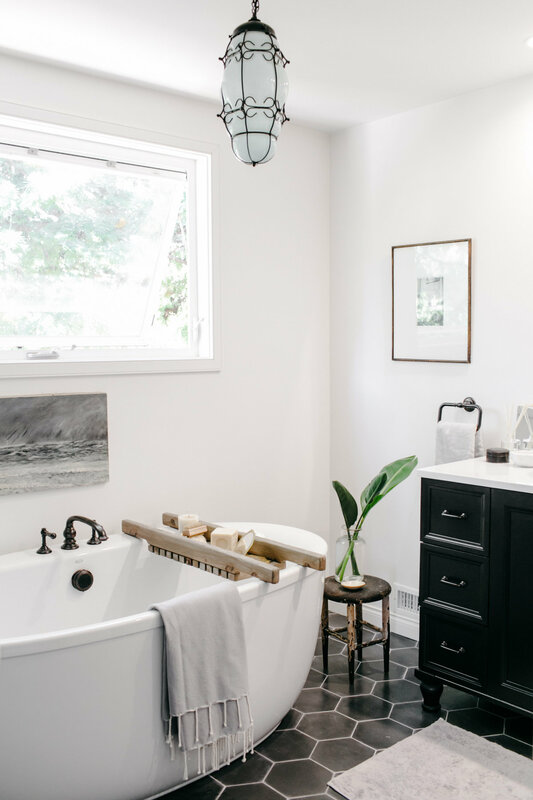 Her bathroom remodel features gorgeous matte black hexagonal tiles by Clé Tiles. The tub and vanity by Kohler and the vintage Venetian Glass Chandelier play up the white and black palette. A California bungalow tour would not be complete without some backyard envy. Victoria's DIY "Cowboy Pool" is made from a stock tank with an added filter. 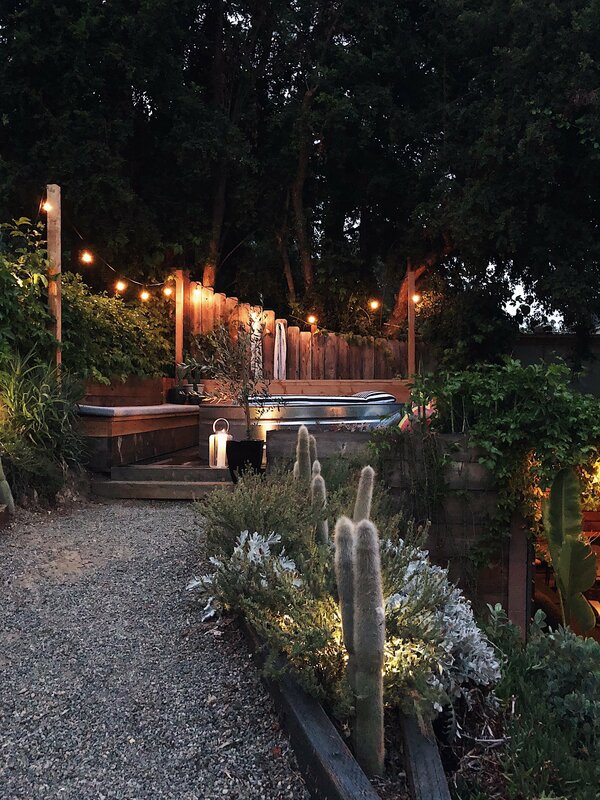 Looking to create your own California-inspired oasis? 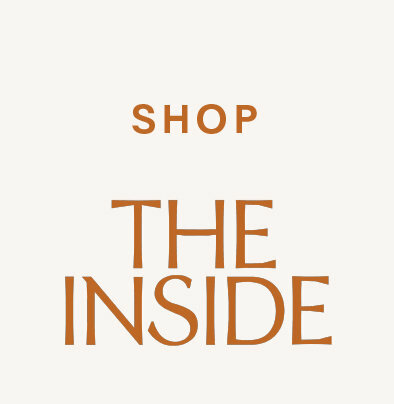 Start by taking a look at Victorias's dreamy and eclectic furniture assortment here.